'A riveting read about an amazing man' THE SUN Legendary boxer Muhammad Ali visited Michael Parkinson's chat show sofa four times, culminating in an iconic interview in 1971. Muhammad Ali: A Memoir is a fresh, revealing and personal account of the life of the most important and enduring cultural figures of our age. An icon of boxing who has inspired the biggest names in boxing, from Mike Tyson to Anthony Joshua, this is the story of boxing's biggest star. Muhammad Ali was God's Gift to the interviewer. Funny, articulate, outspoken with a fascinating life story, unparalleled talent and controversial views. These 4 interviews charted Ali's life, revealing significant phases at different times, charting the rise and fall of this kaleidoscope of a man. 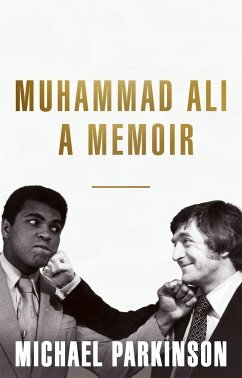 In Muhammad Ali: A Memoir Sir Michael Parkinson will bring his award-winning journalistic talents to bear on this extraordinary man. The book will mix personal recollections of the times they met with selected transcripts of the famous and, in the case of the 1974 meeting, infamous interviews all brought together and contextualised by a sober and honest assessment of the life and times of a figure that, it is certain, we will never see the like of again.